Almost a century ago, the first woman was elected to the US Congress. 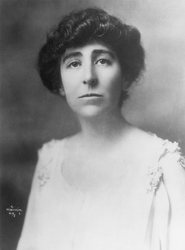 It was in 1917 that pacifist Jeannette Rankin (1880-1973) was chosen to represent the state of Montana in the House of Representatives. When you read what she has to say, you’ll see that women have been saying the a lot of the same things ever since then. To find out more about her chick HERE. • We’re half the people; we should be half the Congress. • Men and women are like right and left hands; it doesn’t make sense not to use both. • As a woman, I can’t go to war, and I refuse to send anyone else. Sadly, and incredibly, Montana has yet to elect another female to congress. And four states have yet to elect a woman to either the House or the Senate. For a list of women legislators by state click HERE. This entry was posted in The Quotable Nerdy Chick and tagged First Female in Congress, First Female in the House of Representatives, Jeannette Rankin Montana, Jeannette Rankin Quotes, Political Women Quotes, smart women quotes. Wow, Kami! This is a pretty powerful post! (when I’m seriously impressed, I alliterate!) Thank you very much for tracking down our first woman Representative. Wish I’d known her!